Now the first time I tried this, my taste buds were in shock. They couldn’t believe how great it was. It’s incredible how the tang of the vinegar, the heat of the spices and the sweet of the pineapple all combine into an exhilarating culinary experience in every bite. And who would have thought to grill a piece of pineapple with GUNSHOT Sauce® on it? It doesn’t get much simpler. 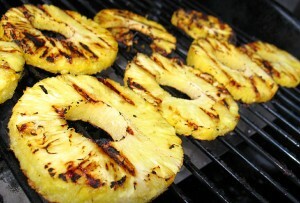 Baste, dip, drizzle, or marinate GUNSHOT Sauce® on each piece of pineapple and place on a medium to hot grill. In a few minutes you should have some grill marks on one side, so flip them over to get some grill marks on the other side. When ready, remove from grill and serve. Some like to baste with GUNSHOT Sauce® while it’s still on the grill. But you might want to try it without basting first as the more you baste while it’s still grilling the spicier it will get (some of the GUNSHOT Sauce® moisture will evaporate leaving more spices behind).